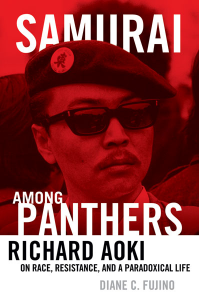 OAKLAND — Diane Fujino, the biographer of Black Panther member Richard Aoki, will speak at the Oakland Public Library’s Temescal Branch at 6:30 p.m. on Tuesday, Sept. 11. Fujino will discuss her new book, “Samurai Among Panthers: Richard Aoki on Race, Resistance and a Paradoxical Life.” The Temescal Branch is located at 5205 Telegraph Ave. in Oakland. Aoki’s life was centered in Oakland and Berkeley, with influences from his childhood in the Topaz, Utah, concentration camp, growing up in West Oakland and an Army stint in the 1950s. He was awakened to political activism during the early years of the Cold War and developed into a significant political leader in the 1960s. Part of the research for “Samurai Among Panthers” was done at the Oakland Public Library. Fujino is chair and professor of the Department of Asian American Studies at UC Santa Barbara. She teaches and studies Asian American activism, Japanese American radicalism, and Afro-Asian solidarities. Her other books include “Heartbeat of Struggle: The Revolutionary Life of Yuri Kochiyama,” a profile of a Japanese American activist renowned for her connections with Malcolm X; and “Wicked Theory, Naked Practice,” on Chinese American saxophonist, radical activist and writer Fred Ho. For more information, visit www.oaklandlibrary.org.